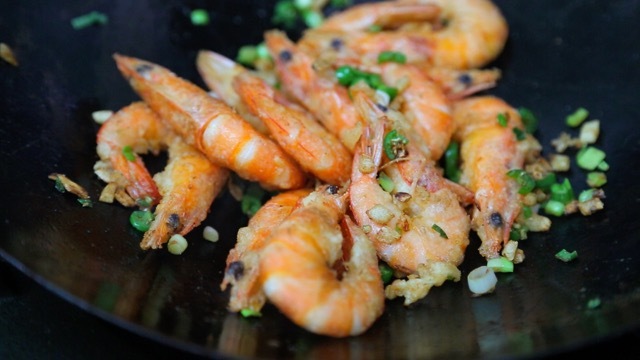 A Classic Chinese dish, salt and pepper flavors is a delicious way to cook shrimp. In this recipe I use the traditional 5 flavors of chilis, green onions, garlic, and salt & pepper. I love how these flavors blend so well together to create a savory dish that's full of flavor and slightly spicy. 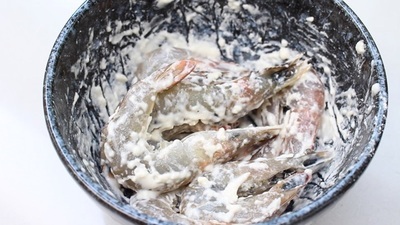 To create the texture of the crispy shrimp, whole shrimp is marinated, then deep fried until just done, with the shell and head in tact. 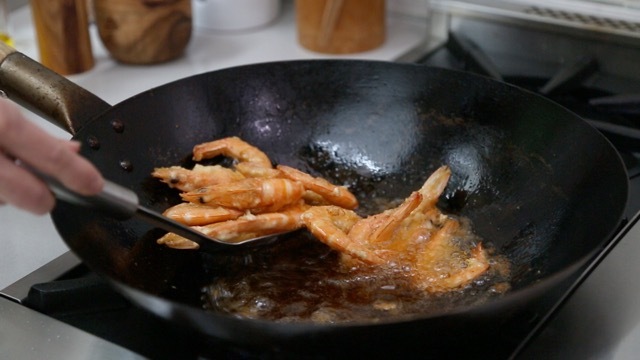 As a final step, the shrimp is then dry-fried with the seasonings to activate the flavors and create a second layer of crispiness. 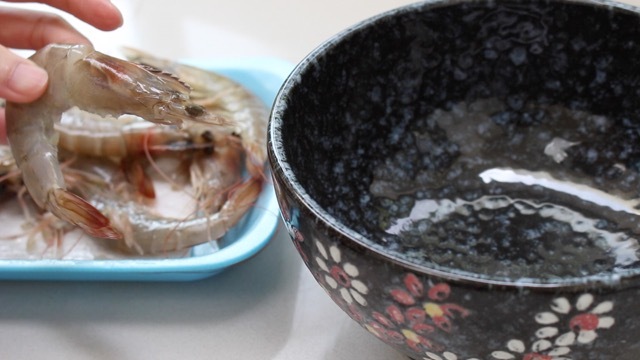 SHRIMP MARINATING TIPS: I use rice wine to marinate my shrimp, but you can also substitue with another Asian cooking wine, or a dry sherry. The alcohol from wine will evaporate from the cooking process. 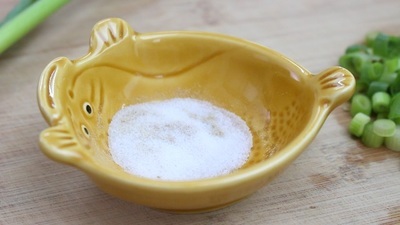 If there's a dietary restriction, you can also replace the wine with water when making the batter. Prep Time = 12 min. Trim the legs and antenna off the shrimp, leaving the head, shell and tail in-tact. Rinse and drain the shrimp then add the rice wine and flour. Mix well. 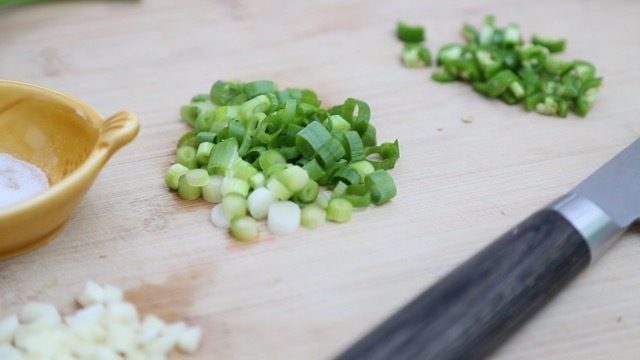 Prepare and chop your seasonings. 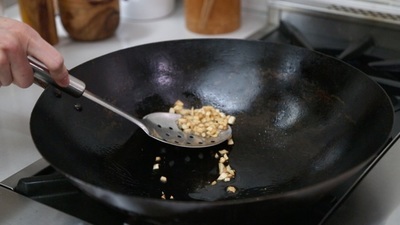 Fry the garlic with 2 Tbsp. of oil until golden brown, then remove and drain on paper towels. Deep fry your shrimp in small batches for 2 minutes and remove and drain on paper towels. In a dry pan, dry-fry the shrimp and remaining seasonings for another minute until well mixed and fragrant.